Howard, Dazzler, Hit-Monkey, and M.O.D.O.K. Marvel surprised everyone at today’s Television Critics Association with the announcement of four new animated shows, all featuring characters one wouldn’t necessarily envision as heroes championing their own series. 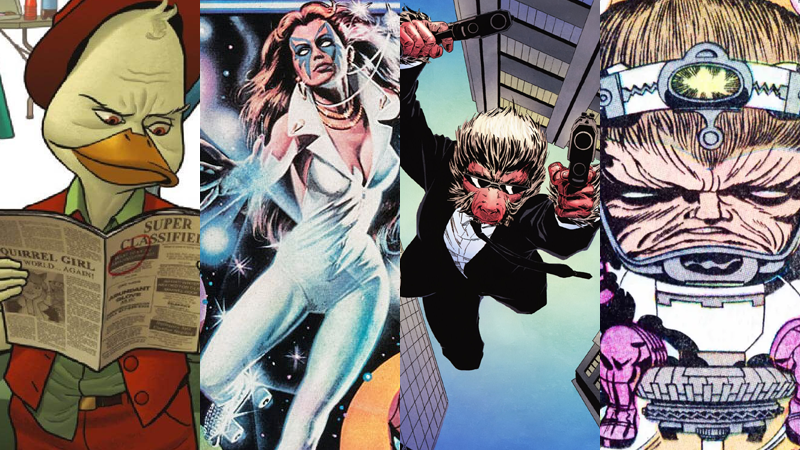 In the very near future, Howard the Duck, M.O.D.O.K., Hit-Monkey, Dazzler, and Tigra will all live on Hulu as action heroes who, one assumes, are meant to be saving the world. Not only that, but the heroes of Howard the Duck, M.O.D.O.K., Hit-Monkey, and Tigra & Dazzler Show will all come together in Marvel’s The Offenders, which is exactly what it sounds like: An Avengers knockoff featuring a cat lady and a duck. This is definitely a surprising turn of events given how bullish Marvel’s been about its own upcoming streaming service—but if anything, this announcement shows that the studio might still have plenty of strange ideas for its intellectual properties. You&apos;ll Never Guess Which Cult Marvel Character Could Be In Guardians!